"Winds of War introduces three new creatures and six new campaigns, which collectively tell the story of the invasion of the kingdom of Channon by the leaders of its five neighboring kingdoms. 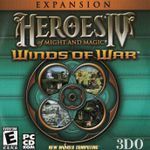 Winds of War was the last installment of the entire Heroes of Might and Magic series to be developed by New World Computing. Afterwards, the bankruptcy of the 3DO Company led to the sale of the Might and Magic franchise to Ubisoft." Source: Wikipedia, "Heroes_of_Might_and_Magic_IV," available under the CC-BY-SA License.